Infinidat » All-Flash Arrays: A Panacea for Your Enterprise Data Storage Woes? All-Flash Arrays: A Panacea for Your Enterprise Data Storage Woes? It’s easy to assume based on all the hype that all-flash arrays are a magical cure for all your enterprise storage and application ailments. But, a more thorough examination of the current and future state of enterprise storage demonstrates that this is simply not the case – for a wide variety of reasons. All-flash arrays definitely have their place in the enterprise data center, and there are clearly workloads for which they are well suited, however, there are other factors that should be taken into consideration before jumping aboard the all-flash bandwagon. 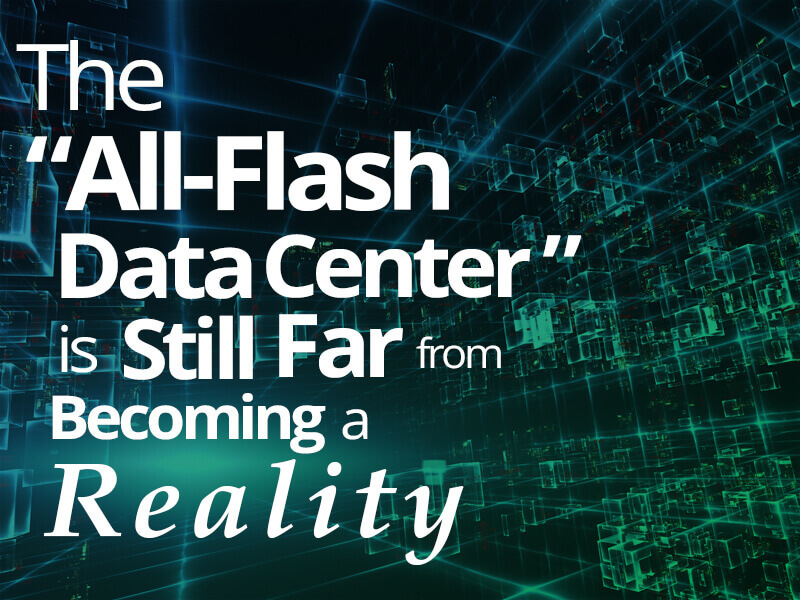 First, despite bold vendor proclamations to the contrary, the “all-flash data center” is still far from becoming a reality. Today, according to IDC, flash’s presence in the data center (while still growing) accounts for only about 15% of the total footprint of external storage capacity sold1. Spinning HDDs, particularly deployed as part of hybrid systems in conjunction with small quantities of flash, are still by far the most prominent media of choice for primary data storage across the widest segment of workloads and use cases. Second, despite recent technological advancements in flash density and gradual reductions in manufacturing cost, flash is still an inherently expensive storage medium without the supplemental and aggressive usage of data reduction technologies such as thin provisioning, compression and deduplication. In addition, all-flash array vendors who have introduced data reduction technologies have often fallen short of their projected/promised savings, keeping costs in the thousands of dollars per TB range. This is primarily due to the fact that data reduction efficacy is unpredictable and highly non-deterministic as it is a function of specific data types and content, and everyone’s data is inherently diverse and different. Banking on data reduction techniques to deliver predictable, consistent TCO reduction is risky business. Lastly, for many vendors, flash is more of a storage technology “pitstop” than a pragmatic, prescriptive full array solution. Today, some vendors exploit flash as a means of merely masking their underlying inability (or lack of desire) to innovate and design new architectures that are able to take advantage of inexpensive, off-the-shelf hardware and more economical, durable near-line SAS drives. Flash presents them with a stopgap method of trying to squeeze more life out of legacy front-end architectures by simply replacing HDDs in their persistence layer with faster media. It’s analogous to dropping a modern high performance, large displacement engine in a 1980s economy sedan. It may go faster in a straight line, but it’s not likely to be very agile or particularly durable over the long haul. In addition, the analyst firm IDC predicts that the total addressable market (TAM) for external flash storage, which was roughly 10% of the total market size in 2014, will increase to 21% by 2019. Hybrid storage solutions are expected to grow from 44% to 54% over the same timeframe, and hard disk only solutions are expected to decline from 46% to 26%1. As you can see, for all the aforementioned reasons and more, present and future demand for hybrid storage solutions shows no sign of abating, despite the expected growth in adoption of all-flash solutions for small segments of the enterprise workload portfolio. True innovations such as advanced native data protection capabilities and highly optimized and automated cache management have the ability to drive significantly higher levels of storage efficiency with inherently lower cost structures than all-flash arrays. INFINIDAT’s flash-optimized hybrid array enables a completely new breed of storage that can manage massive amounts of data, consume less power and outperform all-flash arrays in many workload areas — all with a much higher reliability rate. Delivering over 1 million IOPS, 99.99999% reliability and greater than 2PB of usable capacity in a single floor tile, INFINIDAT storage solutions leverage the latest compute, storage and network capabilities in the market. This piece was excerpted from the executive brief titled “INFINIDAT Flash-Optimized Hybrid Array vs. Current All-Flash Arrays (AFAs).” Download the executive brief to learn where and how these solutions are best utilized in the data center or watch our webinar on “The Pros and Cons of All-Flash Arrays” featuring storage industry experts from TriCore Solutions and Wikibon.